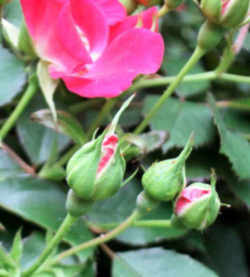 Roses are fragrant flowers with thorny stems. They grow in bushes and can be found in many gardens. Ever popular, the rose was at the top of a school children's poll of favorite flowers in 1891. 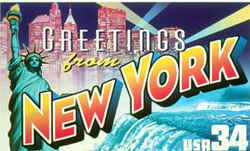 New York did not take official action regarding a state flower until 1955. However when, on April 20, the rose, (Rosa,) was adopted as "the official flower of the state of New York in any color or combination of colors common to it." 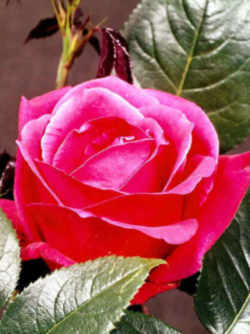 The rose, (Rosa,) wild or cultivated, in all its variety and colors, was made New York State flower in 1955. Roses have always been a part of nature's landscape design. Fossil evidence shows that roses have been around for at least thirty million years. The rose has been celebrated in the art, music, literature, and religions of numerous civilizations since ancient times, and garden roses were cultivated by Egyptians as early as 4000 BC. Some type of rose has been discovered growing wild in almost every habitable place in the northern hemisphere of our planet. Botanically speaking, all roses belong to the genus Rosa, a member of the family Rosacea. Relatives include almonds, apples, peaches, raspberries, and strawberries. In the genus Rosa there are some 200 species known world wide, with countless crosses that have produced thousands of cultivars, hybrids, and varieties. 35 are indigenous to the United States making the rose as much a native to North America as the bald eagle. These species rose plants grow in the wild from which all other roses are descendants. Even in the wild, the roses are an enormously varied group of plants. In size they range from prostrate shrubs to enormous climbers. Their flowers can be large and solitary or small and clustered, and range in color from white through all shades of pink to deep crimson. A few West Asian and Middle Eastern species are even bright yellow, once the most scarce and sought-after color in garden roses. Basically there are 3 different roses: species, varieties, and cultivars. Originals, all having specific different characteristics. Found growing in the wild throughout the world. Given their diversity, the so-called "species roses" are difficult to characterize in general terms. They often have relatively simple five-petalled blossoms and bloom once during the growing season. Though many are unassuming plants, most possess a special grace and charm lacking in their more "refined" hybrid descendants. Two different species can combine very easily to produce a rose that has some of the characteristics from both parents but an identity of it's own. 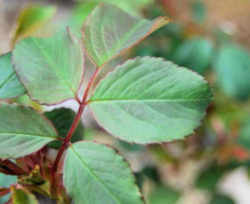 This new variety is borne as a result of the pollen of one rose bush fertilizing the ovary of another. Seeds are formed inside the rose hip (fruit of the bush) that falls to the ground at the end of the growing cycle. The following new season a new variety develops. When nature is the vehicle, such as bees, butterflies, other insects and the wind that cross pollinate the new bush, it is called a variety. When man cross pollinates using all the techniques of an intricate art, those new bushes are called cultivars. The Hybrid Tea has a high centered flower making it the most popular rose by far. Most flowers are borne singularly on a stem although some bloom in sprays. Hybrid Teas come in just about all colors and blends except blue or black. Because of their characteristics of long lasting blooms while maintaining their form they are excellent for cutting and displaying. The majority are very hardy and disease-resistant. Almost all are once-blooming. 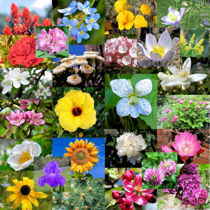 Included in this section are some hybrid varieties which remain very close their parent species in bloom and character. The ancestors of our modern roses have a long history; some of them have graced gardens for thousands of years. Floribunda is true to its name. Tons of flowers are all borne in clusters. Although most flowers are smaller in size than the Hybrid Teas, many have the same shape and petal count; single, semi-double and double. Their low bush size makes them very suitable for hedges and mass planting. Many are disease resistant much more so than the Hybrid teas, and like the teas, they are available in just about all colors. Climber is self explanatory, it climbs. Some are siblings of species and old garden roses (O.G.R.) that had long arching canes especially from the species. Some others are descendants of the shrub and ramblers. The correct description of climber is large flowered climber (L.C.L.) and not just plain climber as it is commonly known. Unlike climbing plants, such as ivy that has tendrils (suction cups or curly end vines) that attach themselves to the surface to which they are growing, climbers require some sort of trellis or fence whereby the canes can weave themselves in and out and around, thus being able to "hang on" or better yet, to be tied down by man. As growth begins and with man's help, if the canes are secured loosely in a horizontal position the canes will produce much more lateral growth (all vertical) and every vertical producing a flower - a spectacular sight to behold. When the canes reach the end of the trellis or fence merely bend them back towards the bush and again attached loosely. By the end of the first season the entire trellis will be covered with growth. I recommend that instead of planting the climbers in the usual straight-up position, angle the bush toward its wall, fence, trellis, etc. Many of today's climbers are sports or mutations of modem roses, many of the Tea, Grandiflora, Floribunda and miniature wood has been grafted onto climbing root stock. There is one exception: Climbing "Summer Snow" is considered a species original. Miniatures are much smaller in every sense of the word. Its leaves, stems and flowers are much smaller than its 4 modern brothers and sisters. They range from 3"-4" to 2'0" or more with the climbers reaching 3'-4'. They are available in all colors and blends except blue and black. Unlike the full size modern roses, minis are available all year long for starting indoors as well as outdoors. It is by far the most disease free of all the modern roses. Polyanthas are the parents of today's Floribunda. They are low growing making an excellent plant for hedging or edging especially in view of the fact they are remontant (repeat bloomers). 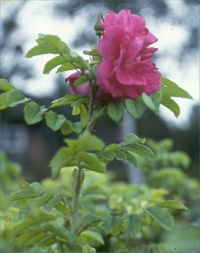 Most have single flowers (less than 10 petals). Remember, most single flower rose bushes are not very susceptible to disease. The Polyantha is a very hardy plant that flowers in clusters. Shrub: The American Rose Society (A.R.S.) has created this class for all bush rose plants that didn't seem to fit within any other class. The Shrubs are easy care very hardy plants. Some are very tall, creating excellent living screen fencing. Some are so short they lend themselves well as ground covers. Some bloom only once a year, typical of many species, while others bloom throughout the growing season. There are many that produce rose hips, an excellent source of Vitamin C. If you do plan to harvest rose hips for jelly, remember no spraying with chemicals. I would only use organic fertilizers. Tree Roses: All tree roses (also called standards) are not cross pollinated. They are produced mechanically i.e. by grafting. All tree roses are derived from 3 separate bushes, one for the root system, one for the length of the stem and one for the flowers. The stems are available in various lengths 15" - 18" for miniatures, 24"-30"-36" for Floribundas and Hybrid teas. If you live in a cold weather climate, I suggest that you plant them in corresponding size pots that can be stored in a protected area (such as the garage) during winter. If they are planted directly in the garden at the beginning of their dormant cycle, the tree roses must be dug-up - laid down in trenches and covered over until spring. They are a very tender plant that requires T.L.C. When planted directly in the garden using miniatures at the base with contrasting or companion colors it creates a ground cover. The combination is very spectacular. ARTICLE 6 - ARMS AND GREAT SEAL OF STATE. 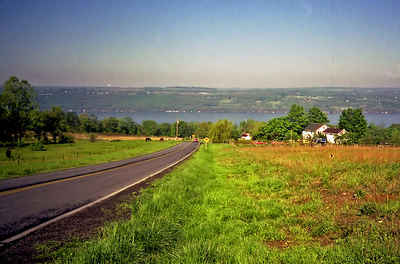 § 75. State flower. The rose shall be the official flower of the state in any color or combination of colors common to it.